Loved the attention to visual detail as well as the humorous and (literally) smashing gameplay 💥! Just left a review on your under-rated 💎! Heist is a unique and comical game about looting everything and breaking stuff. One that’s easy to learn but tricky to master. By everything I mean literally anything that’s not part of the building foundations! Benches, sinks and pot plants are just some of the objects you’ll be flinging around as you try and cash in on time. You’ll often find that it’s sometimes quicker to score by breaking through a window than it is to run to the doorway. The attention to detail is fantastic to, no glass pane breaks the same way twice and every shard has its own physics and weight. The graphics are reminiscent of Pixar models and the music has an Jazzy Noire vibe to it. The physics are realistic with just that bit of a whimsical edge. There are a couple of related “glitches” such as flying on a table your holding, that were left in deliberately to add to the strategic options and humour. You learn a little bit more with each subsequent run and start to chase that elusive score even more. In latter playthroughs you’ll find the game swaps from a Zen experience to a frantic one. Trying to plan the fastest route through the various treasure zones whilst making smashing improvised exits. At the time of writing this gem was criminally underpriced (I’d be willing to part with $10 for it). Thanks for an excellent interactive narrative. The character portraits were awesome (albeit clashing slightly with the realistic backgrounds). The Zen music and sound effects contribute to the chilled yet investigative atmosphere. It was fun piecing together the clues from conversations in this detective mystery. Eatvolve community · Created a new topic Awesome work! Just wanted to say thanks for the unique title. Having a memorable wilderness aesthetic across multiple biomes. Cute animations with the the player changing in interesting ways depending on what's eaten. Movement mechanics feel satisfying from gliding to climbing up walls. Procedural generation feels fresh and varied. To new players: I'd advise making good use of the <Tab> key to determine which abilities they want to swap out when consuming opponents. Shells block damage and sugar gliders can walk across spikes branches. The game is unforgiving and telegraphing of some late game dangers are still being refined. Though it's great to see that the game has been evolved quite consistently from taking community feedback seriously. It was a nice, quick and challenging and fun bullet hell with a comical visual and audio style. Looking forward to what you make in the near future! I <3 how the mechanics evolve as you eat your enemies! Numerous balance changes including nerfing multi-jump. Debug window is hidden by default (with an option to turn it back on). Mini map automatically closes when expanded for too long. itch.io Community » itch.io » Questions, Ideas & Feedback · Posted in Give normal download keys access to external keys? I think this should be made clearer on the website's UI. If you're giving someone free access to the game (particularly an individual download link rather then a bulk one); one would assume that includes external keys if there's no option to specify for or against. 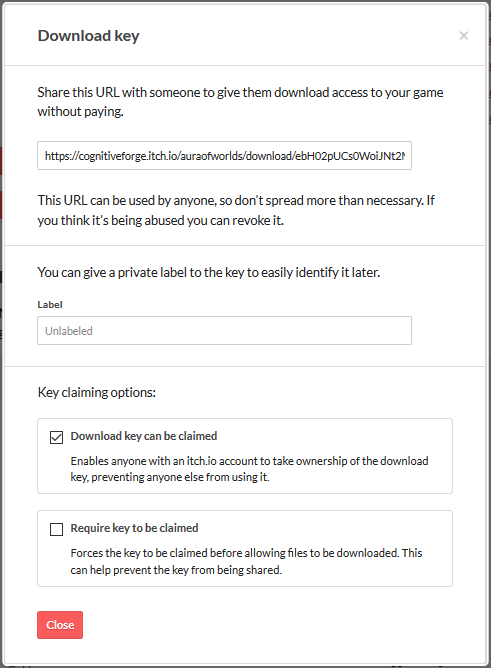 We need all the claimed keys/keys that have one download next to them to have access to the Steam keys; thanks again. The player has 200 HP on Moderate difficulty; Or 160 HP on hard. itch.io Community » itch.io » Questions, Ideas & Feedback · Replied to leafo in Give normal download keys access to external keys? It looks like the only automatic way for users to have access to external keys is through bulk keys? itch.io Community » itch.io » Questions, Ideas & Feedback · Created a new topic Give normal download keys access to external keys? In the past we've granted individual generated download keys to users to close colleagues, friends and influencers. Having launched our game on steam; we wish to give those same users access to a pool of Steam keys as part of the reward for investing on ItchIO early. However users are reporting that they can't access the "Get Steam Key" link and there seems to be no way to link non bulk keys access to the pool of Steam keys. This seems like a bug? What can we do to work around this? Anthony and the rest of the team at Cognitive Forge. Thankyou for the kind words and feedback! The grapple and shield can not currently be dual weilded simultaneously; as the 1st slot is reserved for offensive items based on the advice from most playtesters. The closest thing is using the quick swap button (Y on XBox controller or R on mouse). With regards to certain enemies not targeting alied turrets; well spotted! EDIT: We've fixed that in the latest update 0.61.10; in addition to multiple other feature updates. We had made multiple updates since launching as well. changed how the targeting system works as well as drastically mechanics behind some abilities such as cloaking. Introduced some upgrades to each of the bosses and some unique abilities to steal from slaying them. Introduced new potions and status effects. Some new animations for the necromancer. Yeah; I agree we've updated that to follow the 2x2 segment resolution since; allowing for a better visual consistency. The in game sprites were done by Lachlan Cartland and Jessica Turner. 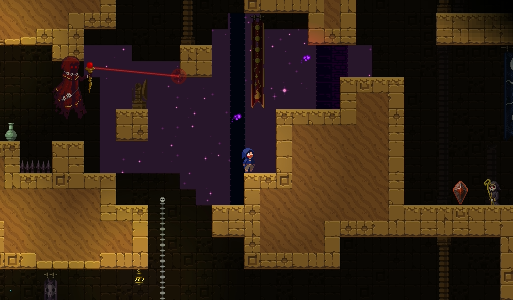 Aura of worlds is a creative tactics roguelite platformer. It has a focus on exploration, improvisation and twisting the environment to your advantage. You progress through utilising your wits, reflexes and a plethora of abilities. Procedural levels range from pursuing walls of toxic pollen to flooded passages lined with explosives to bosses spanning the entire labyrinth. There are multiple solutions to every problem. For example if there is a lava pit blocking a chest do you..? Lure in an enemy and bounce off its head. Use a boomerang to fetch the item from a distance. Chuck a grenade in; destroying the pit and quickly setting everything nearby on fire! We intend to extend the game with feedback from the community. Getting the game now; entitles you to all future updates; a reduced price and an extra key on Steam. 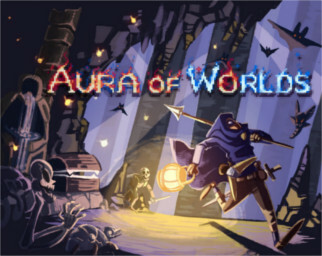 Aura of Worlds has been in development since 2013 and has been refined from continual player feedback from developer meetups like IGDA and trade shows such as PAX. 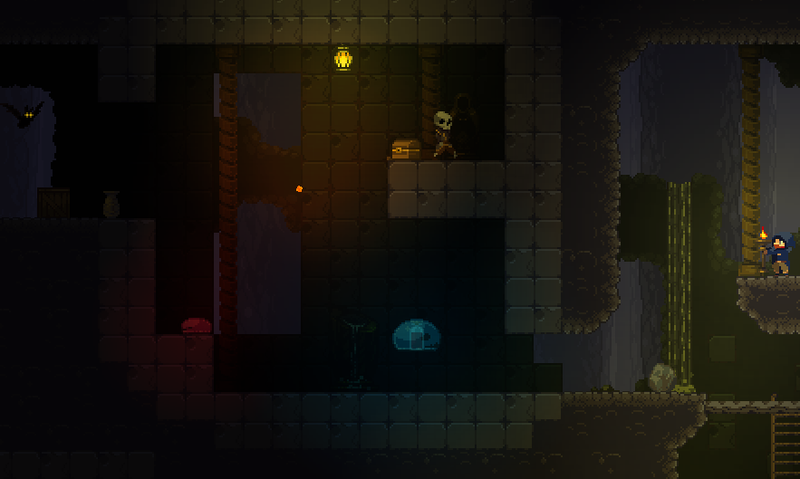 The game is in a stable state with over 60 enemies and traps, 3 procedural worlds, 8+ level themes and more. Content is still being added and feedback is welcome 😊. If you have suggestions; please feel free to post them here; or in the comments section of the game page. Neat; playing it reminded me a of Downwell :). The walls and enemies don't currently affect the player, there terminal velocity & gravity are a bit too high and the difficulty should increase as you progress. Also the default jump sound could be a bit less jarring. Though I'm sure this will get ironed out in the future. Thanks for your support @hebdomad! Thanks for your support ireadtabloids! We'll continue to update the game on a regular basis :). Thanks so much for your support Raven :)! as well as helping us spread the word :)! It was great to see you at both GX And PAX; thanks for buying the game at the latter. Your visual novels are amazing and I love the art style and narrative of Death of Magic :). Thank you :)! We have much more content for you over the coming weeks. Also thanks for leaving a review; it really does help the project to get noticed :). Added a system of runes; which give the players perks including being able to glide, being able to carry and throw things unimpeded, stealing health enemies. Added a new boss: the bronze soldier. 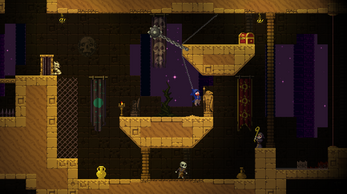 Some additional enemies and traps. Updated most of the graphics, particularly in the garden area. Extended the sound track with several more tracks including a unique musical piece for bosses. Multiple other tweaks, rebalancing and bug fixes from player feedback. We'll be exhibiting the game at PAX Australia from the 26th-30th of October and so our responses may take longer during this weekend. We will however endeavour to respond to comments as soon as possible :).